I am taking a little break - have had a lot of stuff going on in my life the past few weeks and need to have a bit of time away to clear my head. I've had a word with the boss and he has kindly agreed to a bit of time off. 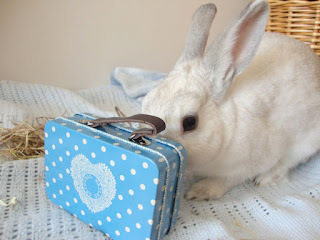 In fact he has decided to have a holiday himself, so we are going to close Cottontails for a couple of weeks. We will both be back on Monday 17th June. have a lovely relaxing time Charlotte :) and I hope Rudolph has a few less demands for this fortnight! loved your BunVogue! so funny! !